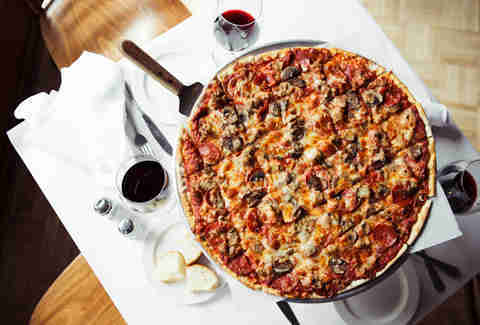 M ilwaukee has an abundance of pizza in many different styles, from NYC slices to Chicago deep dish. But by far the most beloved style of pizza here in Milwaukee is what you can get at the little mom-and-pop shops: thin, cracker-style crust with plenty of toppings, cut into squares (aka party cut, because it’s always a party with pizza!). 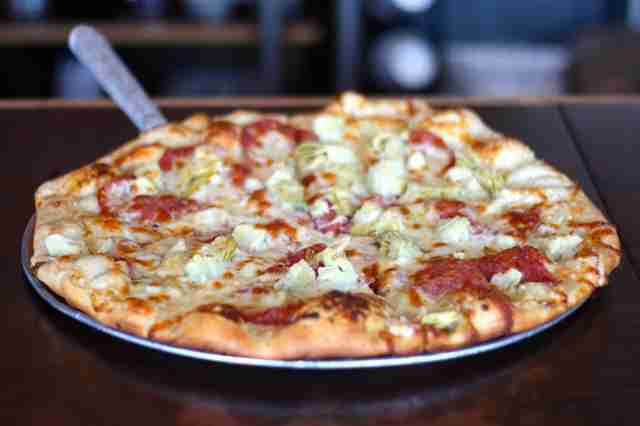 Here are the best pizzas you can get in Milwaukee, in a range of styles to suit everyone. Though Pizza Man has been around for a long time (minus a temporary hiatus from a devastating fire), the pizzas have evolved with the times, and include newfangled toppings like arugula, lamb sausage, and the one that divides people most: cream cheese. 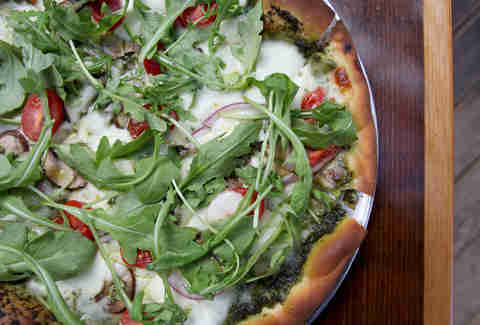 Try it on the Artichoke a la Mode (the most popular pizza on the menu), or go green with pesto-sauced pizza topped with fresh arugula for a fresh, bitter kick. The Zaffiro family, who are Sicilian immigrants, started making pizzas in the early '50s, and their pies have become a quintessential Milwaukee treat. There’s no reason to stray from the most popular topping combination around these parts: the sausage, mushroom, and onion remains a stand-out. While every local pizza place in America offers this combo, Zaffiro's doesn't have to have invented this wheel to have perfected it. Alphonso’s is a little take-out and delivery-only spot named after the owners’ mentor... Alphonso, who willed his precious 1969 Camaro and his family’s (even more precious) recipes to owners Tim Szuta and Corey Washington when he passed in 2005. The Heavy Chevy is dedicated to him and his beloved drag racer, and includes just about every topping on the menu. Like all Alphonso's pizzas, the bake time is long, which ensures the middle of the pizza isn’t soggy under all that meat, veg, and cheese. 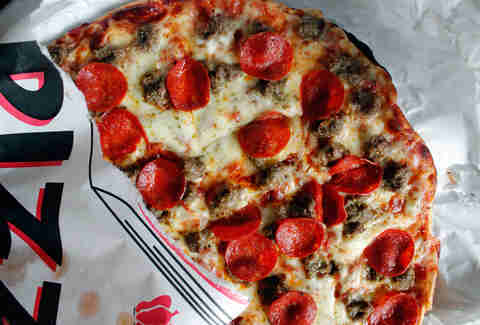 If you’re not a kitchen-sink-pizza type of person, the standard sausage and pepperoni is perfection on a crunchy crust. There’s a ton of pizzas to choose from at this sleek spot, which also offers lots of live music and an extensive bar. All the options come on a pillowy, fluffy crust with lots of charred bubbles. You can get a range of toppings, from classics like prosciutto to, uh, less-common choices like salmon or shrimp. Many of the options come with a creamy garlic sauce in place of tomato, in case you want to ward off any vampires/romantic prospects -- try it with the roasted chicken breast and pan fried potatoes. Scotty’s makes a number of different kinds of pies, from thin and crispy to stuffed pizza with sauce on the top. The sweet spot seems to be in the middle, though, with the pan pizza: it’s a thick, doughy crust that’s got a nice crunch on the bottom, topped with a double helping of cheese. It’s not exactly like the deep dish you can get in Chicago, but it’s how we do it up north, and it's just as delicious. Ian's brunch is here, which means that it's now possible to start your Sunday with a Brisket Hash brunch slice -- or if you have a sweet tooth, there's a yogurt, fruit, and granola concoction called Jamberry Jam, which comes topped with berries and honey pistachio ricotta cream. There's a pizza for everyone here, from a very solid, greasy, NY-style pepperoni, to the ultra carb heaven mac & cheese (which you should always, always order with bacon). Despite the range of atypical toppings, none of the pizzas are a gimmick: everything at Ian's is made from scratch. The latest incarnation of pizza restaurants run by the DeMarini family since the 1950s, Little DeMarinis is run by the granddaughter of the original owners, and still uses their classic recipes. Large pizzas come in a rectangular pan with a distinctive crust that rolls up the sides of the pan. A serious throwback-joint, you can choose canned or fresh mushrooms... in case you don’t despise canned ‘shrooms, or you’re 60+ years old. Get 'em on a sausage, mushroom, and onion for a perfect, old-school combination. Known for pasta and an extensive wine list, this Italian date spot also serves up a seriously tasty pie. The Diavola is an interesting mix of toppings with pepperoni, giardiniera peppers, cream cheese, and pineapple, for a sweet/hot combination. It’s creamy, a little meaty, and definitely wakes up your taste buds. A south-side staple for just about as long as anyone can remember (1969 in fact), Ned's serves up the thin crust, square cut pies that Milwaukeeans love. They're heavy on the pizza sauce -- no dry pies here -- and cheese, making for a pizza that's almost too gooey as you pull off a slice… almost. The dining area is small and in need of a makeover, but hey, at least there is one. A coffee shop that serves pizza? It's not that weird once you see the huge Ferrara wood-burning pizza oven that was imported from Italy. 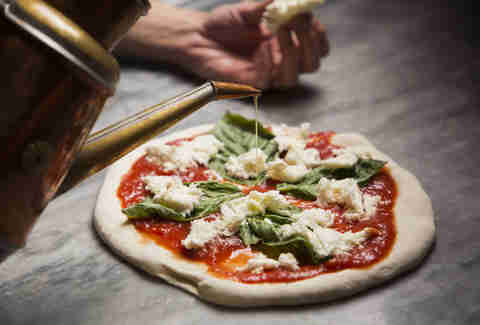 Thanks to that bad boy, pizzas cook in only a minute or two, in true southern Italian style. 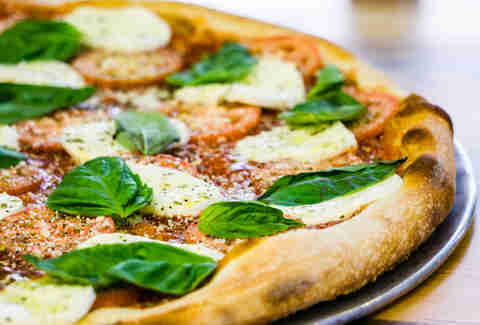 Try the classic margherita pizza first, because it's just beautiful in its simplicity, ash it down with a glass of wine or a beer -- yep, this coffee shop has booze too. The owners of Wy'east moved to Milwaukee from Portland where they operated a popular pizza truck. Those same pizzas have found a permanent home here in a renovated spot with a small dining room on Vliet St, where pizzas are cooked quickly in a super-hot, wood-fired oven, with dough that's had an extra-long fermentation time, which leads to better flavor and texture. Toppings and pizza names are influenced by the Pacific Northwest, like the Hot Marmot topped with pepperoni and hot peppers pickled in a maple syrup brine. This tiny shack, painted bright red and green, pumps out some of the best pizza in the city. The total customer area is about 5 square feet, so you’ll have to either wait at the bar across the street or call in your order ahead of time. The menu is small, and you won't find any fancy toppings here; Hup's serves up hearty, simple pie that's been sustaining the neighborhood for decades. The Italian sausage is bold with fennel, and makes a perfect pizza topper. The pizzas at Maria’s are shaped by the sheeter, which means that they come in shapes that can't truly be described by geometric, and they will always overflow on the pan. Get pepperoni, as it’s the kind that gently cups into a delicious grease reservoir, ready for Parmesan. The Christmas lights on the ceiling, paint-by-numbers on the walls, and bouffant hairdos on the senior wait staff are all just amazing bonuses that add to the charm of this neighborhood spot. DiModa’s pies differ from the super-trendy (but still delicious) Neapolitan style thanks to its thicker, doughier crust -- so if you're someone who thinks the center of a Neapolitan pizza is too thin and soggy, then give the "fuggedaboutit" with sausage, buffalo mozz, cipollini onion, and mushroom a try. Dogs are always welcome on the secluded patio, and even get their own menu of Scooby snacks, gelato, and puparoni pizza. Drinking from the decorative fountain is optional. Milwaukee-style pizza, with its thin, crackery crust often suffers from one major problem: sogginess, especially in the center of the pizza where pieces have no outer crust rim to support the weight of the toppings. Fixture has set out to solve that problem by applying the sauce on top of the cheese, and has been largely successful. Sure, the pizza may look a little strange, but at least it won't flop a greasy heap into your lap. 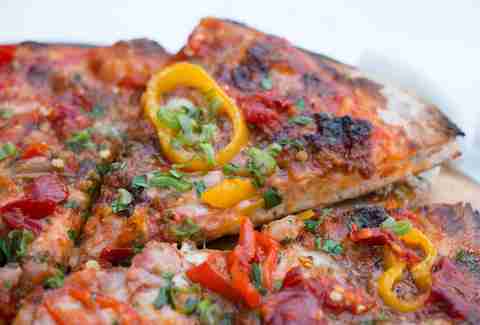 Pizzas are named for local businesses, so don't feel strange when you order the D.I.X. 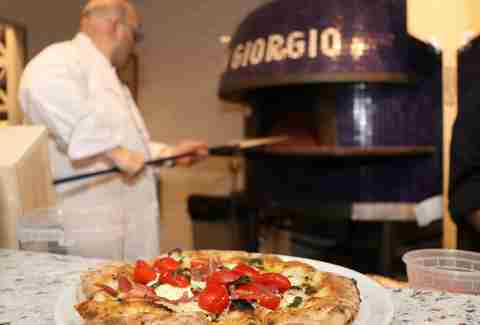 The focal point of San Giorgio is the conical blue pizza oven, imported straight from Italy, which pumps out pies at breakneck speed while diners sit around it at the bar and watch the action. 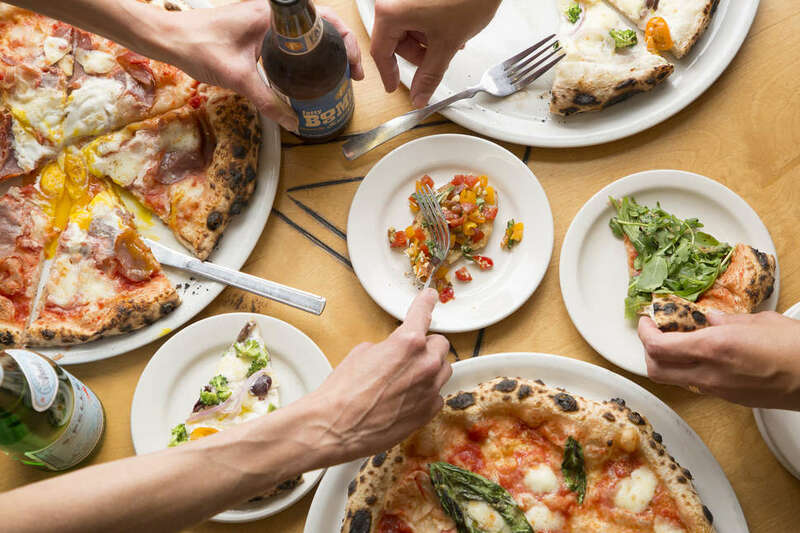 This is the only VPN-certified pizzeria in Milwaukee, which means the owners pay a lot of money to be evaluated by the supreme Neapolitan pizza gods, who dictate everything from ingredients they can use to the size of the yeast packages they can buy. Maybe that really makes a difference, and maybe it's just marketing hype, but either way, it's good pizza. Housed in a 19th century building that has been used as a tavern and a brothel, Santino's serves up Neapolitan pizza in the very northern tip of Bay View. The neglected building got a full renovation, including a few nods to The Godfather, and now boasts an abstract ceiling mural lit in hot pink at night. Pizza crust is made with Caputo brand 00 flour, the standard for this kind of pizza, so you should stick to the classic margherita to appreciate the simplicity. A huge 10-ounce meatball makes for a mighty app. Lacey Muszynski is a Milwaukee food writer who could probably eat an entire 20” pep from Ian’s if left to her own devices. Follow her @worthhersalt.